We have emerged from an impenetrable bank of fog and into a surrealist’s setting. The perfectly flat cloud carpet is literally at our feet. It extends for miles in all directions, so it is as though we are primordial creatures emerging from the mist onto the banks of an alien island world. The ridge top above is fire scarred and dotted with the skeletons of recently charred conifers. An impossibly-green carpet of thigh deep grasses and sedges has aggressively replaced the old growth. The brilliant, cloudless New Mexico sky accentuates the already dreamlike landscape. Other surrounding ridge tops appear to also be floating atop the sea of fog, like a conifer-studded archipelago. Years ago, I could only imagine such a place. I remember standing at the fence line on Highway 4 looking at the elk rut in the big “Valle” the way a school kid looks at a favorite just-out-of-reach toy in a toy store. Signs dotted the fencerow. Back then the Valles Caldera was privately owned and only moneyed folks could pay the hefty $12,000 price tag to hunt (or fish) this amazing parcel of land. In the 90s, the ranch came up for sale, and with the help of the New Mexico delegation, a deal was brokered and the Valles Caldera Trust was created by the Valles Caldera Preservation Act of 2000 to preserve and protect the historic Baca Ranch of New Mexico’s Jemez Mountains. The groundbreaking legislation that provided for the federal purchase of this 89,000-acre ranch nestled inside a volcanic caldera also created a unique experiment in public land management. While the Trust has done an excellent job running the ranch in the years since then, a new model, more true to our North American model of conservation is being sought. The proposal seeks to place Valles Caldera under management of the National Park Service, a change that would benefit both the land and the public. What will happen with that proposal – only time will tell. With the fog below us, Lane and I focus in on the herd we’ve been dancing around as we made our way to the ridge. In the previous half hour, we had frenzied up close and personal call in encounters with four different satellite bulls and innumerable cows and spikes. They came at us like ghosts through the fog, milling about and plaintively calling to us, then disappearing again as quickly as they appeared. At least a dozen thundering bugles still sound out within earshot. One in particular is deep and throaty. More bearlike than a sound an elk might make. I let out a series of cow calls and then chuckle into my bugle tube. The “grizzly bear” roars back at me somewhere right below the fog line. Apparently all the satellite bulls have scattered his cows and he’s raging mad. He’s closing in on us quickly now. Lane scrambles behind a big charred Douglas fire and I scurry 75 yards up the hillside onto a crest of the ridge above, so the bull can’t see where the calls are coming from. I let out another series of mixed cow and calf calls and a high pitched rag-horn bugle. The bull roars again, much closer this time. His massive antlers appear out of the mist right below Lane. He stops and rakes a small tree, ripping it from the ground and tossing it aside. The massive bull trots up the hill and stops to roar at me not 5 yards from Lane, then saunters on another ten yards or so. Lane draws his bow and stops the bull with a cow call. The arrow smacks home and the bull bolts up onto the bench where I am hidden. I bugle at him again to stop him. He stands for a moment, then trots about 50 yards and piles up into a log jam. The bull of a lifetime. 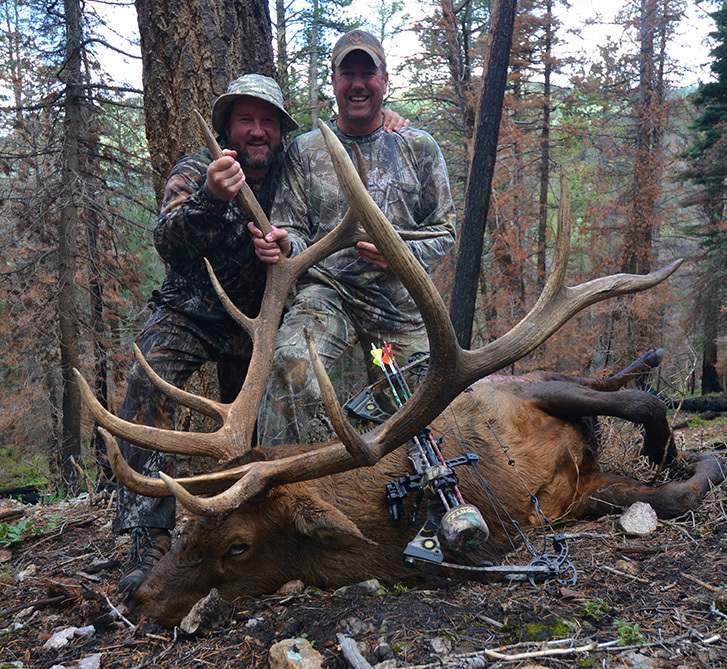 A world-class hunt of a lifetime in one of New Mexico’s most iconic ecological and cultural national public lands treasures – the Valles Caldera. Just more proof that intact habitat means better hunting and fishing opportunity. And a real nice account of the hunt, Garrett. That's a heckuva bull. I'm going to have to get out there myself. I haven't even crossed NM off of the list of states I've visisted. Now at least I know where to go. This is the way it ought to be, life changing experiences available to the greater public can only be good for this country. Best of all, it's sustainable.